A FLUMP dredges 18" of settled rendering sludge in a single pass. SRS Crisafulli. Application: Dredging settled rendering sludge from discharge ponds. Contacts: Windel Stracener, Director of Operations, Michael Grosskopf, Special Projects Manager. Type of Facility: Rendering Plant. 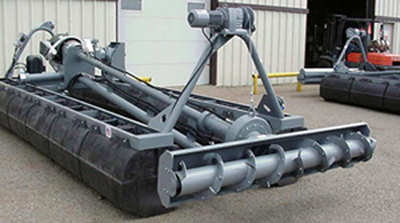 Griffin Industries uses its Crisafulli FLUMP on a rotating basis to dredge and manage settled wastes at multiple sites. The 4” Severe Duty FLUMP has foam-filled modular polyethylene pontoons and coal tar epoxy coating throughout. The FLUMP dredge is operated manually from an on-shore control panel with a hard-wire remote control capable of giving commands from up to 400 feet away. The Crisafulli FLUMP is transported from site-to-site on an as-needed basis. In addition to the controls the system consists of a 75 HP Crisafulli slurry pump, floating discharge piping and a two-post manual cable traverse system. The nature of the sludge is similar to a thin tar and the FLUMP has been successful removing up to 18” of settled sludge in a single pass. Pump on/off speed and direction, traverse speed and direction and dredge cutterhead depth make for a versatile and highly productive dredge operation.